Are you seeking the services of a professional plumbing contractor to peform a trenchless sewer line repair in Milpitas, CA? No doubt, when shopping around for the help of a local plumber you want to hire only the best in the business to work on your project. In addition to skill, a company who values and respects your home is just as important. Here at Chandlers Plumbing, we are a contender in the industry for that very reason. We have a solid history of providing great service in the greater Bay Area. As a locally owned company, we’ve been serving the communities throughout California for more than 14 years. Whether you’re dealing with a cracked or broken sewer line in need of repair, or a trenchless sewer line replacement we are standing by ready to provide you with assistance seven days a week. We even offer free estimates for sewer line repair in Milpitas. Call us today and we will dispatch a qualified plumber who specializes in sewer line replacement. He will examine your sewer line using a specialized camera to get an eye-in-the-pipe of your sewer system. From there he will make a recommendation on repairing or replacing the sewer line. Providing both longterm and short term solutions with cost in mind. We offer fast and affordable sewer line replacement service in Milpitas, San Jose, Santa Clara, Cupertino, Saratoga, Campbell, Los Gatos and throughout the entire Santa Clara County. Contact us today to schedule an appointment for your free sewer line repair estimate! Questions About Trenchless Sewer Line Repair in Milpitas CA? What Is A Trenchless Sewer Repair? Traditionally, a sewage repair job consisted of digging up the lawn or backyard to save the sewer line. Advances in technology have allowed for a noninvasive method of performing repairs and replacements to a sewer line. As the name implies, a trenchless sewer repair enables experienced plumbing contractors to work without having to dig a large trench. Yes, homeowners expect very little damage to they’re landscape which is why many are opting for this method of repair. Is a trenchless sewer repair the best option for you? That largely depends on the amount of damage that the existing line has sustained. Typically, an initial inspection must be performed using a specialty navigation camera that is long, flexible and snaked into a pipe through a drain inside the residential property. This camera is able to provide a thorough view of the underground sewage system. The visuals will give our plumbers an idea of the length of the sewer line and the extent of its damage A hydrostatic test may also be conducted to determine whether there is any leakage to the draining system. Yes, a trenchless sewer repair requires extensive knowledge on the behalf of the professional. Our plumbing contractors have experience in successfully completing repair jobs using this noninvasive technology. Pipe Bursting Technology is used in trenchless sewer line replacement projects. Pipe Bursting can cut the cost of replacing an entire sewer line in half when done correctly. Pipe Bursting is a sewer replacement process that involves utilizing a large cone shape head that is pulled through the sewer run via a steel cable that. The old piping is broken apart underground while a seamless HDPE pipe is pulled into place. A lateral sewer line is replaced through small incisions that are made to access points. This prevents the need of evacuation and ensures that your property remains to enact. A major benefit of a trenchless line sewer repair is that it is much cost effective option when compared to a conventional sewer repair. Did you know that a traditional trenching job can cost as much as 20,000 depending on how much labor is required? The great thing about a trenchless repair is that it eliminates the need to hire labor to dig a trench to the sewer line and homeowners don’t have to worry about repairing the damage done to the landscaping which can cost thousands of dollars. Also, a trenchless sewer repair means you can expect your home’s sewer line to be repaired in no time. A traditional sewer repair project can take several days to repair. However, after the initial inspection is performed a plumbing contractor can begin working on your project as soon as the next day and can be finished within a day or two. With a trenchless sewer repair in Milptas, homeowners can expect higher quality results. This method of repair uses new and advanced materials which are bound to improve sewer function. In fact, they increase the flow capacity and the dimensions of the pipe. Also, with these improved materials helps prevent common problems like rusting. If your home’s sewage system is in need of repair, overall a trenchless repair job is the best option. It preserves your home’s landscape, saves on expenses and you’ll get greater quality results. Pipes are a critical component of any system. After all, the pipes are what transfers the waste through the sewage system and out of the house. What happens when the sewer lines or pipe are damaged? 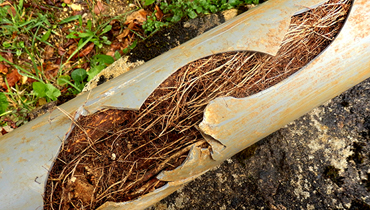 There are numerous risks associated with a broken sewer line. In fact, a broken sewer line can have a negative impact on one’s health. Damaged sewer pipes can emit harmful gases such as methadone and ammonia which when released into the home can lead to poisoning. Gas poisoning can cause asphyxiation and a host of respiratory problems. Even just a bit of exposure to these toxic gases will result in irritation to the eyes and mucous membranes. Broken sewer pipes will also release several other types of dangerous bacteria into the home including E.coli, salmonella, and pinworms which typically affects the digestive tract. Raw sewage carries different types of bacteria that can lead to residents becoming infected with cholera or jaundice. This happens if you have bodily contact with these bacteria through the toilet or even by using the water running in a sink. Although, dealing with a broken pipe in the sewage system can be a daunting task it’s best to seek help from a qualified plumber for a trenchless sewer line repair in Milpitas Ca as soon as you detect the issue. Of course, trenchless technology isn’t foolproof. Whether you’re interested in a trenchless sewer repair or replacement having an experienced professional at the head of your project is crucial to its success. Whenever work is being done to an underground sewage system, contractors have to be careful not to damage nearby utility and water lines. Also, gas leaks is another additional potential problem when a trenchless sewer repair and replacement in Milpitas Ca is performed. Damage done to the utility lines and gas leaks can pose a risk not only to the homeowner but they’re neighbors as well. As with any large plumbing project, unexpected costs can arise. While pipelining and Pipe Bursting technology is convenient these processes are complicated and can result in problems along the way. In many cases, trenchless methods have proven to be successful but it’s important to note that it doesn’t solve all sewage problems. Surprises can delay the entire project in worst case scenario trenching may be required to fix the issue. To minimize the risks our team of experienced plumbing contractors will assess every risk possible prior to the start of the project. We also formulate customized plans on how to safely repair or replace sewer lines. Trenchless Sewer Line Replacement has been approved for use in the state of California by sanitary district authorities. Unlike, many plumbing services, Chandler Plumbing specializes in this non-invasive plumbing method. We have successfully completed numerous trenchless repair and replacement projects. Hiring an experienced team is imperative in order to reduce risks and receive the best results possible.